The Peoples of the North fishing crew catching fish on the Opala Rive, Kamchatka Territory. Of the 2 million hectares of the offshore strip only 1% of the area is used. Situation in the fishing industry in Russia’s Far East remains unsatisfactory, Nikolai Patrushev, the Secretary of the country’s Security Council said on Tuesday at a field session of the Council on the isle of Sakhalin. "The situation in the fishing industry in the region, which is vital for ensuring foodstuff security in the country, remains unsatisfactory," he said. Patrushev pointed out the outdated fishery fleet and the insufficient number of processing factories on the shore. "These factors affect the development of the Far-Eastern fishery sector and reduces its role, in essence, to the supplies of raw fish. 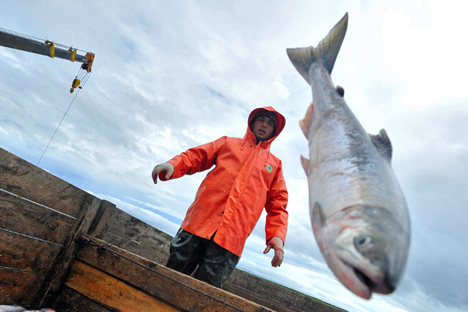 "The share of the Far East in the all-Russia output of commercial-grade aquatic culture is a mere 3.5%," he said. "Of the 2 million hectares of the offshore strip only 1% of the area is used."